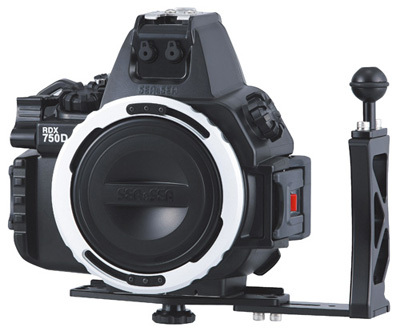 Compatible with the EOS 750D / 800D / Rebel T6i / T7i camera. 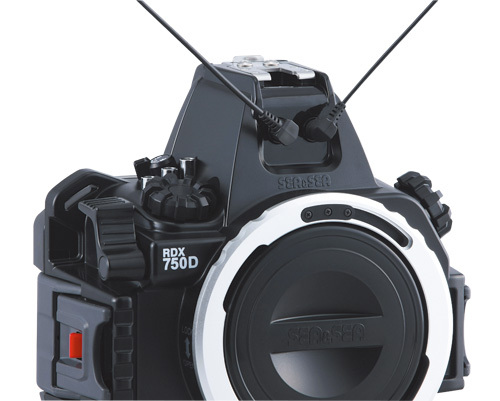 RDX-750D housings with the over 15220101 serial numbers (last four digit numbers) are compatible with all the aforementioned cameras. 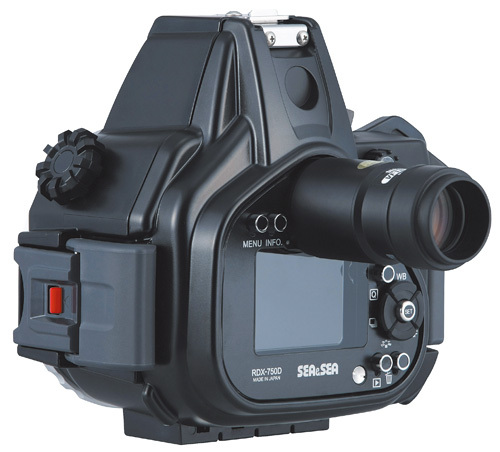 By attaching the VF180 prism viewfinder (magnification ratio of 1.2x) to a SEA&SEA housing, the magnification increases by 1.2x and entire field of view can be seen at the same time. Recommended for users committed to strict composition and focusing. By inserting the Fiber-optic Cable into the housing connector, an external strobe will be optically connected to the camera’s built-in flash, enabling full-featured strobe photography and allowing the user full creative lighting expression. Camera Quick-Shoe for easy mounting and removal of the camera. Mounting the camera becomes a breeze as you only need to slide the camera quick shoe into the slot, up to the designated position. 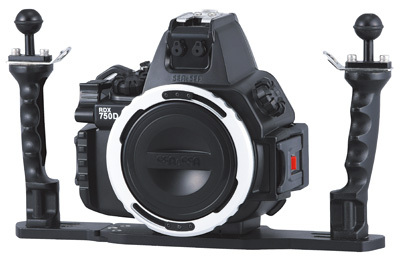 There is almost no need for complicated positioning and gear alignment so even beginners can easily mount a camera. By attaching an SA8, a SEA ARM 7 Compact or a similar arm set to the tripod socket at the bottom of the housing, up to two external strobes can be mounted. When using the optional Grip-Stay L II, you can hold the camera firmly with both hands just as you can with conventional housings. Features a Optical Viewfinder 0.5x that makes it easy to see the whole field of view. An optional exchangeable viewfinder can be selected as well. Various ports including NX ports can be mounted with the RDX Port Base L or the RDX Port Base S in order to accommodate many kinds of lenses. Easily operated shutter lever, excellent for quick snapshots. The shutter lever can be operated in two ways – by pushing from the top and by pulling from the front – and offers a smooth ‘halfway press’ for adjusting the auto-focus, so there is no need to worry about missed chances. Large buckle structure (with lock function). Makes it easier to open and close the back cover than existing (metal) locking latches. Strong and durable build, with a depth rating of up to 60m / 200ft.